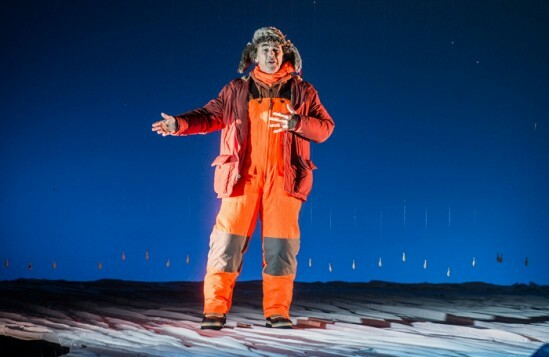 Back on the London stage for the first time since his Oscar win for Bridge of Spies and a starring role in Steven Spielberg’s The BFG, Mark Rylance is now a movie star as well as an actor whose every theatre appearance has long been savoured for the unpredictable, quirky and in-the-moment intelligence and daring he brings to it. 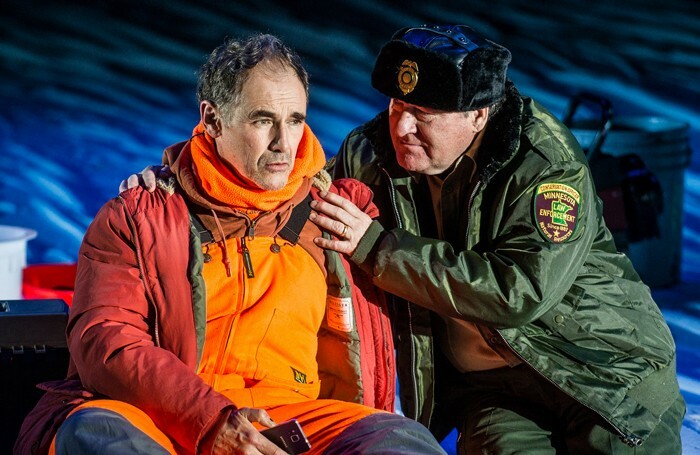 If it is really true that there are some actors you would come to hear read the phone book, Rylance is one of them. Here he has indulged a personal passion for the prose poetry of Louis Jenkins to fashion a tapestry out of the writer’s work that functions as a kind of weird meditation on life itself. The use of visual metaphor is very Beckettian: two ice-fishermen passing the time as they wait to snag a catch from the hole they’ve drilled into a frozen-over lake. The stage is covered by a vast sheet of ice – when I saw the play earlier this year at New York’s St Ann’s Warehouse, the audience was steeply raked so it felt like the ice was advancing upon us, but in London the stalls are looking up at it (and some of the sightlines have been reported as poor). But if the play feels a bit like Waiting for Godot on ice, Godot actually arrives here in the shape of a large fish. 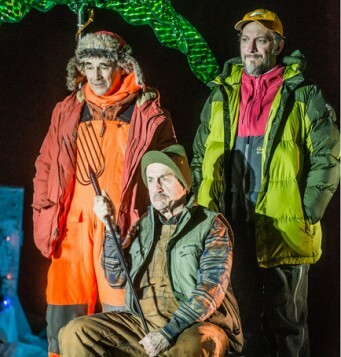 And as in Godot, there are also some distractions for the fishermen: an officious officer establishing whether they have a fishing licence, and a young woman and her grandfather. There’s not much plot. 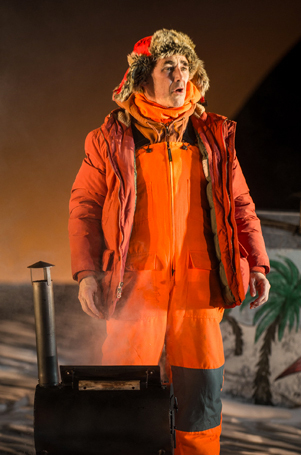 But there’s plenty of pleasure in watching Rylance – in an orange boiler suit, looking a bit like Kenny from South Park – and Jim Lichtscheidl sharing thoughts on weather systems, the Big Bang, and somersaulting into the void, in this eccentric but exhilaratingly odd production.